It has been 17 years since Lesley Banks graduated at Glasgow School of Art. Soon she was producing numerous small paintings and constructions. Before long we were climbing the steep stairs up to her attic studio in Glasgow's west end to select work for showing at Compass exhibitions. After a time she joined us to work part time at Compass Gallery and in due course decided to find a studio and become a full time painter. It seemed no time till she magically turned up with a collection of her new work that simply could not be disregarded. We fixed her first solo show at Compass Gallery and it was an immediate success. Her paintings had a character of their own - recognisable types of people in familiar domestic settings. But there was an element of mystery in them: a feeling of uncertainty, perhaps even danger, leaving the viewer with a sense of unease and the feeling of something going on beyond the edge of the canvas. 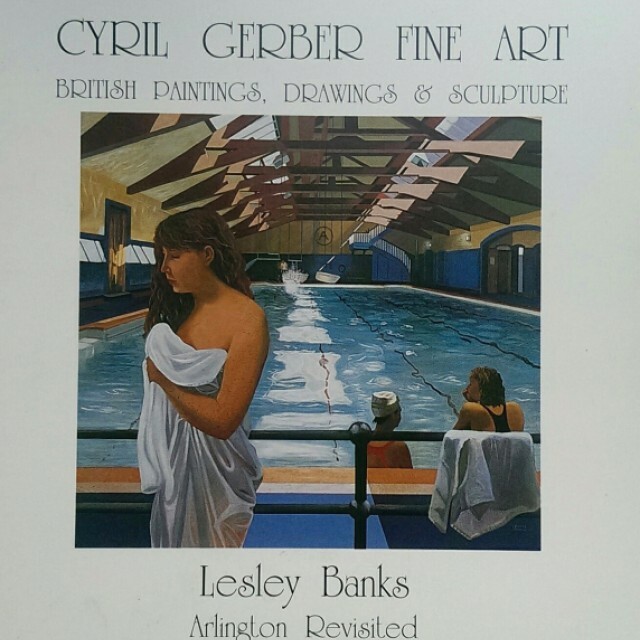 Lesley had persuaded the management of Arlington Baths to allow her access to sketch and paint the swimmers and there followed her first series of works based on these visits. The success of her early shows led to a steady flow of exhibitions including solos in London, Bath, Edinburgh and Singapore. She made numerous trips to Italy and won various awards including the Britannia Life Lord Provost's Prize in Glasgow in 1997 and more recently was the artist in residence at Edinburgh Zoo. Now she has returned to the Arlington for a further taste of its special atmosphere and exhibits her latest series of paintings for the first time in this exhibition. "For me, the Arlington Baths have long been a continuing source of inspiration. The recent renovations have sparked off the idea to produce a second series of work, based on the many facets of the Baths. This time I have been drawn to the flickering play of sunlight both on the water and the walls. The Turkish room, a temple of relaxation, formerly a pale muddy green, is now a vibrant ultramarine with tiny coloured glass windows on the roof. On a sunny day, pools of red and turquoise light are dispersed around the room. In general what appeals to me is the timeless quality of the Arlington and the thought that for 150 years, men and women wrapped in white sheets have been relaxing there regardless of the reality of life beyond its walls." Lesley Banks.